In commemoration of the 75th anniversary of Executive Order 9066 and the 25th anniversary of the Manzanar National Historic Site, Manzanar is hosting two public archeology projects from March 24-29 and May 26-30. 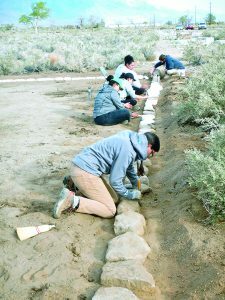 Volunteers will have the opportunity to assist the National Park Service in uncovering and stabilizing Manzanar’s historic administration and staff housing area. Participants will also learn about the common and contrasting experiences of camp staff and incarcerees, as well as the differences between Japanese landscaping aesthetics and “western” military-style landscaping. Cherstin Lyon, author of the book “Prisons and Patriots: Japanese American Wartime Citizenship, Civil Disobedience, and Historical Memory,” and the award-winning California State University San Bernardino History and Anthropology Clubs will participate in the project from March 25-27, marking their fifth year returning as a group. Art Williams, who lived in the administration area as a teenager and wrote the book “Reflecting on WWII, Manzanar, and the WRA,” will also present a program. Volunteer positions are available to anyone age 15 and over who is physically able to work outdoors participating in moderately strenuous activities. Participants will be digging with shovels and small hand tools, cutting and loading brush, using wheelbarrows, collecting rocks to reconstruct landscape features, painting rock alignments and screening sediments to retrieve artifacts. The work will be conducted outdoors, regardless of weather. Volunteers may work any number of days or hours, but a full day or multiple days are preferred. Bring water, lunch, work gloves and wear sunscreen, a hat and sturdy boots. Advance sign-up is required since the project is limited to 25 participants per day. To sign up, contact Manzanar Volunteer Ambassador Katie Busch at (760) 878-2194, ext. 3312, or email katherine_busch@partner.nps.gov. For project questions, contact Cultural Resources Manager Jeff Burton at (760) 878-2194, ext. 3305, or email jeff_burton@nps.gov.